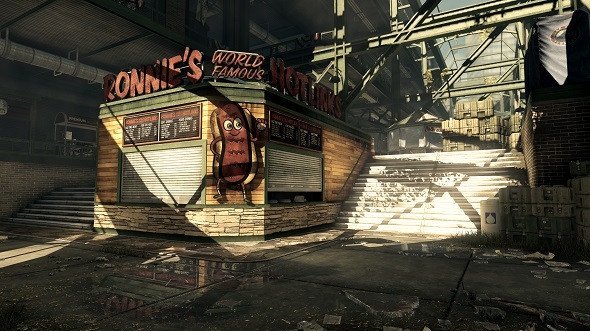 Yesterday Activision, as it was promised, told us the latest Call of Duty: Ghosts news. 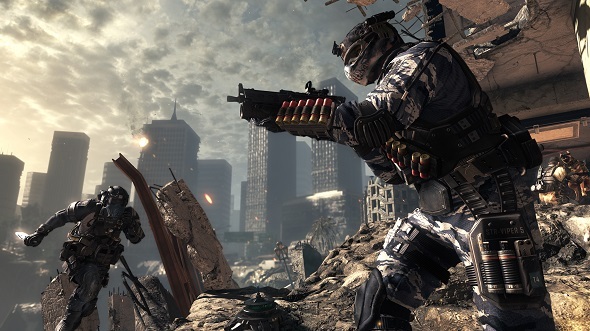 Thus, during the live broadcast from Los Angeles, the game developers presented a multiplayer, described and demonstrated its main features, modes, and first CoD: Ghosts collector’s editions. 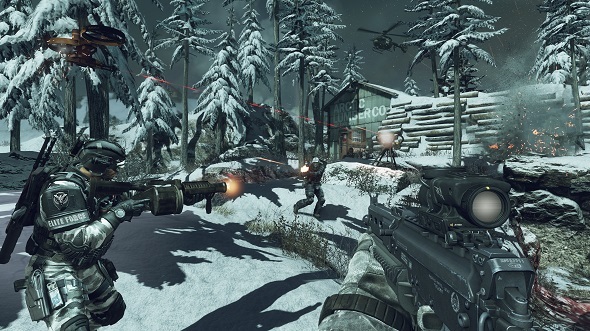 The small Call of Duty: Ghosts trailer, showing how the game’s multiplayer mode will look like and accompanied by a previously unreleased song by Eminem, was shown the first. So watch the active combat operations, depicted in the video, and enjoy the song from American rapper. The developers have also presented two game modes (they are seven in the multiplayer) called "Cranked" and "Search & Rescue". The first one is a deathmatch, where the kills will increase your speed and agility, but you’ll have to kill your enemies very quickly in order not to combust spontaneously. The second mode is also the deathmatch, but here you’ll have a chance to respawn, if after your death, your tags will be recovered by your ally, and not by the opponents. In this case, the game is over for you. The game developers have presented another Call of Duty: Ghosts trailer, in which they tell us about such game’s feature as Clan Wars. 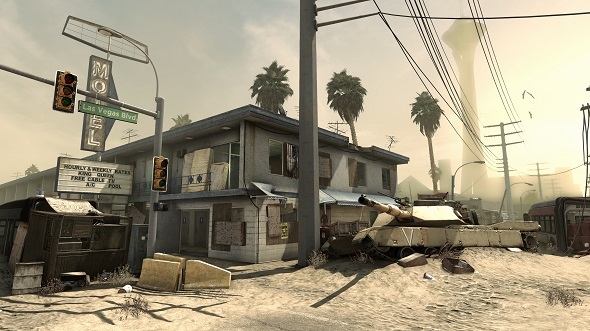 According to Activision, any such war will continue for two weeks, during which you’ll have to occupy the territories in exchange for points (the longer you hold a certain area in your possession, the more points you get). One clan, which will win the war, will be awarded with additional bonuses. 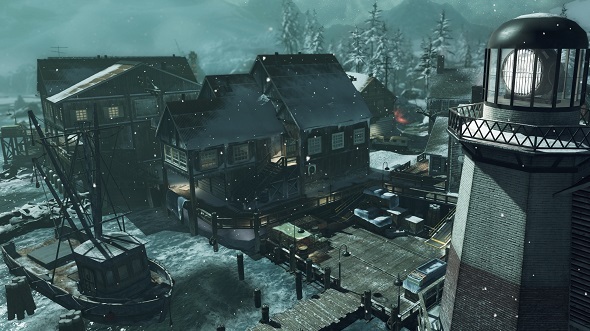 And the last important news are CoD: Ghosts collector’s editions. So, the developers of the shooter said that they would release two editions. 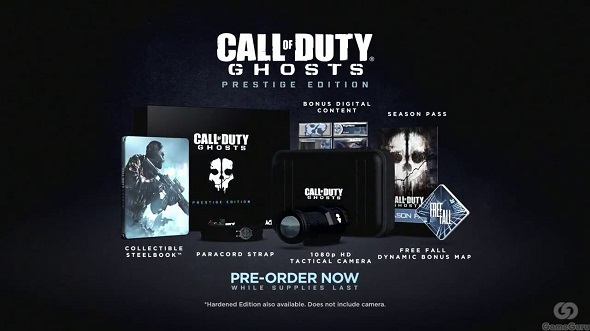 The first one, which Call of Duty: Ghosts game will get, is titled the Hardened Edition and includes the game in the collection steelbook, the bracelet, "Free Fall" map, the soundtrack to the game, the season pass and the range of digital content (the player card and patch). The second edition of CoD: Ghosts is called the Prestige Edition and will cost you €199,99. It consists of all of the same, plus portable HD 1080p camera. Activision company has decided to celebrate this momentous event and has published an image with all these nice bonuses and another Call of Duty: Ghosts trailer, dedicated to the Prestige Edition. So watch, enjoy and buy. And we, as always, do not forget to remind you that Call of Duty: Ghosts game is scheduled for November 5, 2013 for PC, Xbox 360 and PS3, and a little later for PlayStation 4 and Xbox One.